By Monica Grady, The Open University. It’s been a great few weeks for missions to small, primitive bodies. We’ve just about digested the latest news from the Ceres asteroid and rejoiced at the recovery of the comet-lander Philae, in time to wish a safe journey to NASA’s exciting new mission to Asteroid 101955 Bennu. OSIRIS-REx (short for Origins, Spectral Interpretation, Resource Identification, Security, Regolith Explorers – which is a bit of a mouthful) launched from Florida’s Cape Canaveral at 7:05pm EDT on September 8. This is a very special mission – it’s not just going to map the composition of the asteroid, the mission is going to bring some of it back for us to study close up. The analysis of the precious grains may come in handy, as asteroid 101955 Bennu is on a collision course with Earth. That last sentence is maybe a tad of an exaggeration – according to Dante Lauretta, the head of the mission, Bennu has around a 1 in 3,000 or so chance of colliding with Earth in the late 22nd century. Although such odds may seem quite frighteningly probable, and Bennu is high up on NASA’s table of potentially hazardous objects, the first possible collision with Earth is not until September 2175. By that time, I’m sure we will have learnt so much about the asteroid from the material brought back by OSIRIS-Rex that we will know how to deal with it. There were three reasons why Bennu was selected as the target for OSIRIS-Rex: its orbital dynamics, its composition and its hazard potential. The orbital dynamics of Bennu are important because they will allow the spacecraft to get there in a reasonable timescale (estimated arrival date is August 2018) without requiring too much in the way of planetary swing-bys for gravitational assistance (it will make one Earth fly-by in September 2017). Bennu’s composition is also interesting – it has been determined by instruments on ground-based telescopes to be rich in carbon, one of the most primitive of asteroid types. So Bennu might be almost unchanged since the solar system formed some 4.6 billion years ago, and may contain a variety of organic compounds that became the building blocks of life. 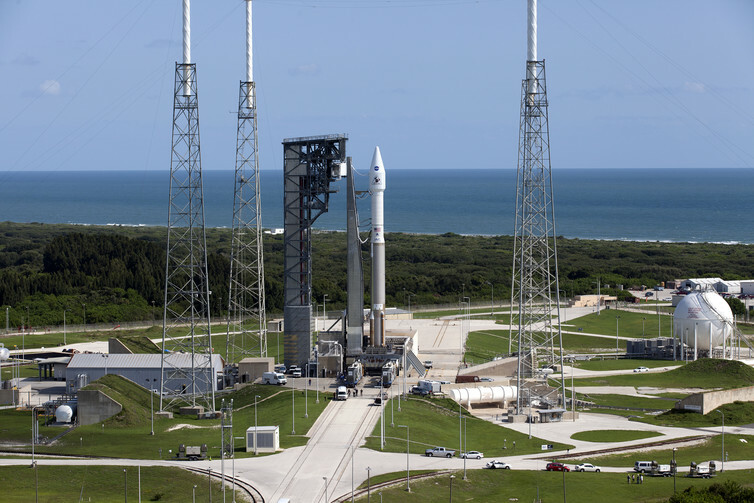 The United Launch Alliance Atlas V rocket is ready for launch. We have learned a huge amount about asteroids and comets from the Dawn and Rosetta missions – but both these missions have left many unanswered questions. It is quite frustrating to see some of the results and realise that the image resolution is just not quite sufficient to make out certain features. One of the first acts of a geologist, when examining rocks in the field, is to break open a sample, and look at the fresh surfaces of the interior material. Such an act is not an option on a mission that relies on remote sensing to identify different materials. But OSIRIS-Rex will make that possible when it returns the sample in 2023. OSIRIS-Rex is not the first asteroid sample return mission: the Japanese Hayabusa mission brought back several hundred grains from Asteroid 25143 Itokawa in late 2010. The grains came from a stony asteroid, not a carbon-rich body, and do not seem to contain much in the way of organic material. And although NASA’s Stardust mission collected dust from the coma of comet Wild 2 in 2004, returning it to Earth in 2006, it has been very difficult to measure any organic compounds present in the dust because of the way the dust was collected (impact into aerogel). But the sampling mechanism on-board OSIRIS-Rex is different: it is called the TAGSAM (for Touch-And-Go Sample Acquisition Mechanism). The TAGSAM is deployed at the end of an articulated arm and, when it touches the surface, a burst of nitrogen gas will fire down into the regolith. This will force material backwards and up into the TAGSAM. It is hoped that almost 100g of material with a variety of grain sizes will be collected for return to Earth. Analysis of the sample will be carried out by an international team of scientists; measurements will cover all aspects of the material’s composition and structure, especially the organic and water contents of the soil. One experiment that OSIRIS-Rex will carry out as it orbits Bennu is to determine the extent of the so-called “Yarkovsky effect” on Bennu’s rotation. This effect is a force that acts on a rotating body in space, caused by the uneven release of heat from the surface of the asteroid. Once this is known, it will be possible to investigate whether we could use this force to change the orbit of Bennu. For example, this could be achieved by focusing solar radiation onto its surface, which would change the strength of the Yarkovsky effect and ever so slightly alter Bennu’s course. Because the effect is so tiny, and difficult to measure precisely from Earth, the observations taken at Bennu will be the most accurate that have ever been made. This will allow engineers to calculate whether deflecting an asteroid using solar radiation is a realistic possibility, and the length of time it would take to shift an asteroid’s orbit from “collision course” to “missed by a mile”. I have every faith that such calculations will be carried out before we get an even closer look at Bennu than we desire.